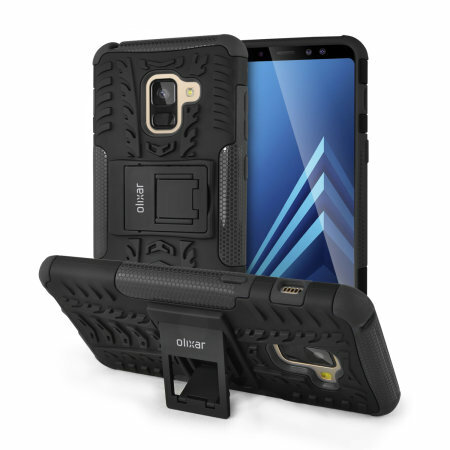 Protect your Samsung Galaxy A8 from bumps and scrapes with this black ArmourDillo case from Olixar. Comprised of an inner TPU case and an outer impact-resistant exoskeleton, with a built-in viewing stand. It was promptly dispatched and the product was just what I wanted. This tough protective case has been designed for those with an active lifestyle. It provides great shock and impact absorption thanks to its lightweight TPU polymer with a precisely positioned hard skeleton for added protection. The design of the exoskeleton extends out to protect vulnerable parts of your Samsung Galaxy A8 such as the corners and sides. The Olixar ArmourDillo Protective Case features a tough exoskeleton, which covers the back and vulnerable corners of your phone from damage. They are made from an impact-resistant, polycarbonate plastic shell protecting your Samsung Galaxy A8 from accidental damage - keeping it looking as good as it did when you bought it. This tough protective case has been designed specifically for the Samsung Galaxy A8 and has cut-outs for the main ports and features of the smartphone such as the camera with flash. The power and volume buttons are covered, but remain functional while encased to give unbeatable protection.